Cushion compacts have taken the UK beauty market by storm proving they're no fad, beyond gimmicky and a game changer for multiple reasons. And Lancôme the beauty brand that brought them to both department and high street stores has gone one step further and released Teint Idole Ultra Cushion Foundation. Unlike its predecessors which are typically soaked in a light BB-esque foundation Teint Idole Ultra is both long wearing and packs a punch in the coverage department. And whilst foundations come and go in my collection, this cushion compact is here to stay - could the quest for complexion perfection be over? I haven't yet needed to flip the cushion over in attempt to dispense more product, but I'll keep you updated. In terms of volume and value, the cushion compact contains just 13g of foundation and costs £30.00 opposed to the bottled version which retails for the same price yet contains 30ml. However, refills cost £19.50 and all in all I use far less product in comparison to pumping out the product onto the back of my hand. You win some you lose some I suppose! Overall, it's safe to say I'm excited. I would never have thought a near enough perfect complexion was possible with a cushion compact, but this stuff has decent coverage, is fun to apply, handbag friendly, comes in many shades and undertones and leaves my skin looking pretty darn lovely (even if I do say so myself!). 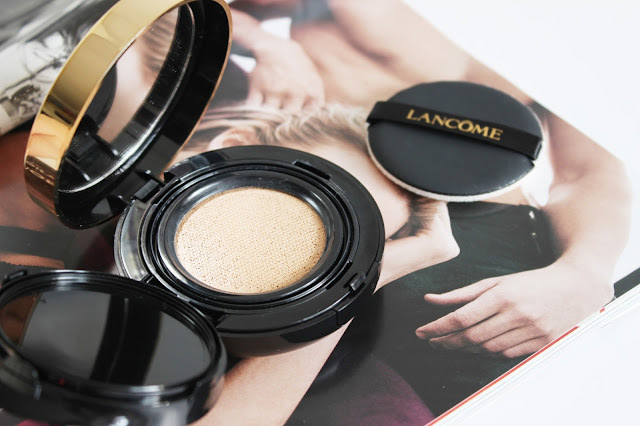 Lancôme you have yourself a cushion compact convert. Have you tried Lancôme's latest release?